Maybe among those of you who feel that traveling to mountain or beach attractions is a normal thing and less challenging. 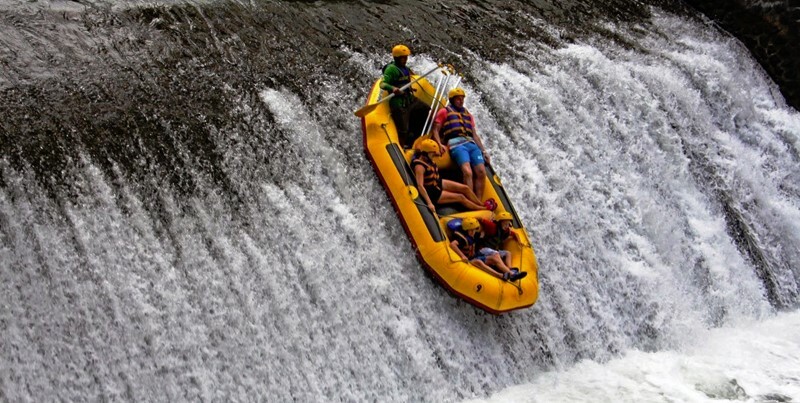 If yes, what if you try the Telaga Waja River rafting experience? In this place, you will feel a different holiday sensation while in Bali. Especially for those of you who like challenging activities and adrenaline. If you need Bali car rental with driver, of course we can help you. Karangasem may not be the name you will associate with outdoor adventure that makes your adrenaline rushes, but in fact, there are quite many adventure activity options you can do in this area. One of the most popular outdoor adventures that you can do with the whole family (even kids) is Telaga Waja Rafting. This is a rafting in a river that gets its source from Mount Agung, so the river itself is very fresh and clean. 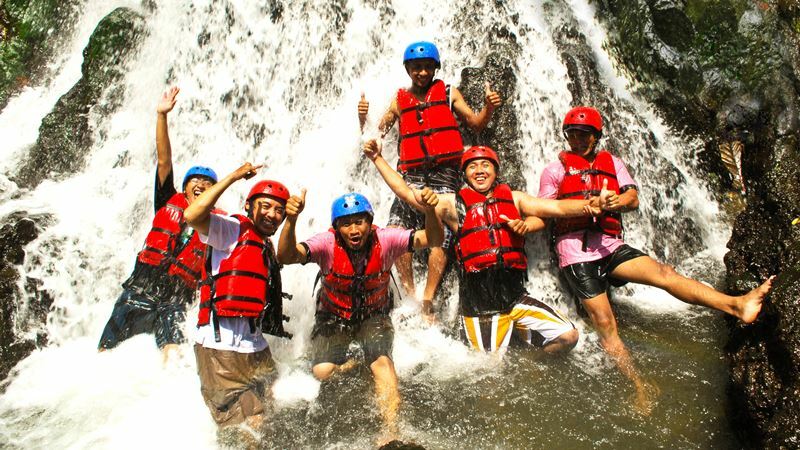 This activity combines adrenaline pumping adventure, fun family activity and beautiful view of the surrounding forest. Telaga Raja Rafting spot can be reached by car for 2 hours from Kuta or 3 hours from Nusa Dua. Telaga Waja Rafting is suitable for family adventure, because the river stream itself is not too strong, albeit still challenging enough to pump your adventure soul. This is a popular activity to offer by various travel companies and hotels in Ubud, and it is always fully booked during peak season. 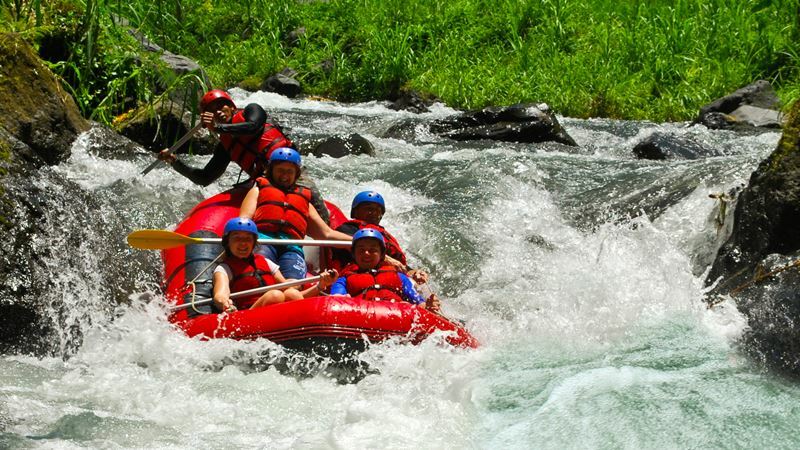 Telaga Waja Rafting Bali is a complete package; once paid, it includes equipment, safety instructions, guide, buffet style foods and beverages. Visitors also get free Bali coffee for welcome drink. However, visitors are not allowed to bring their own food and water. Telaga Waja Rafting spot is also located near coffee and tea plantations that offer free coffee as well as herbal tea samples to visitors, so there are some other activities to do around the area besides rafting. Although Telaga Waja is considered as ‘mild enough’ for rafting, it nevertheless provides challenging ravines and streams to conquer. The water level in this river is relatively low, but there are many challenging streams especially grade 3 and 4 rapids. The river also has many rocks and boulders, and the super memorable finish is a dam that forms 4 meter high of waterfall, where the raft is finally dropped before you reach the end of the journey. All of these sound challenging, but actually this is considered as leisure rafting, and you can even bring kids as young as 7 years old for this adventure in Telaga Waja. Telaga Waja Rafting is a combination between adrenaline pumping adventure, beautiful scenery, good service and family friendly outdoor adventure. Price may vary depends on which travel company or hotel that offers you the rafting package. However, this is an adventure that you will never forget; book for Telaga Waja Rafting and starts leisure adventure in this beautiful river in the East part of Bali. If you have any tour idea to combine Telaga Waja River Rafting with other sightseeing tour, please feel free to contact us to get some tour suggestion from BaliCabDriver staff.